Since 2009 Elite Academy of Dance have been entering Pupils for Royal Academy of Dance Ballet Exams, with stunning success, results have been well above the UK average. 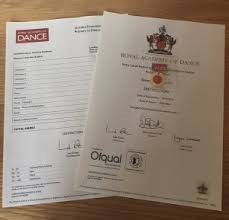 This has allowed students along with the specialised training received at Elite Academy of Dance to take this success forward to successfully audition for Scottish Ballet Associates, The Dance School of Scotland and Ballet West. Royal Academy exams continue to be accredited by the SQA in Scotland, which therefore leads to UCAS points from Grade 6 and above. These UCAS points can be used in addition to school qualifications for applications to College and University. Students have worked really hard to reach the standard required for their ballet exams. Therefore they are ready to show the examiner what they have learned. On the day all students will have to have the correct RAD uniform. Girls will require to have their hair in a bun. Makeup, earrings, and nail varnish are not permitted while taking the exams. Students should arrive in plenty of time, the exam timetable is strictly controlled. Therefore any students who are late will miss their exam. Naturally students are nervous on exam day. Especially as their teacher is not allowed in the examination studio in conjunction with having to dance to a stranger. However the RAD examiners allow for this and yes of course everyone will make mistakes during the exam. Its so important that any mistakes are forgotten about and students move on to the next section of the exam. All students will have the advantage of taking a mock exam prior to sitting their exam. Finally everyone remember you have been taught and trained to sit the exam Your examiner will not ask you to don anything you don’t already know. Once you have sat your RAD Ballet Exams you will normally have to wait about six weeks before you receive your results. Of course some pupils will de delighted with their results, others might be disappointed. Everybody is different, you can have great day or a bad day at exams. The exam result details scores out 10 for each of the 10 sections being examined. This gives you and your teacher a great idea of weak and strong points to work on for your next exam. Finally everyone should be really proud that they have worked so hard to achieve the standard required to sit their exam and be even prouder that they have achieved the RAD standard. → Silver Swans Ballet 4 today.